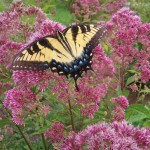 Blackswallowtail gathering nectar from Joe Pye weed. Extension Gardener classes and workshops are open to anyone wishing to learn more about environmentally sustainable, science based gardening. More classes will be offered in 2018.